Is there a diagram of the 2010 camaro's exhaust? I'd like to do an exhaust upgrade, possibly a x-pipe and loudmouth II axle back and would like to get an idea of what I am looking at. I am a automotive novice so I will take all the help I can get. This is for an SS2. Last edited by daphatgrant; 08-02-2009 at 03:54 PM. Those are catalytic converters near the manifolds, and the other is a resonator I believe. X-pipe is the short blue piece between the yellow and purple. What I am looking to do is beef up the sound of the car (SS2 R/S wM6S). Like I said I am trying to learn as much as possible, from what I can gather I think I want the Borla axle back s-type. Does adding a X-pipe change the sound enough to merit installing it? Or if all I am looking is a more aggressive sound should I just stick with the axle back and call it a day. I am not looking for a performance increase, and am not looking to do anything that would require it to be retuned. Last edited by daphatgrant; 08-03-2009 at 06:40 AM. The orange components are resonators, the blue component is the H-pipe, and the red components are the cats. 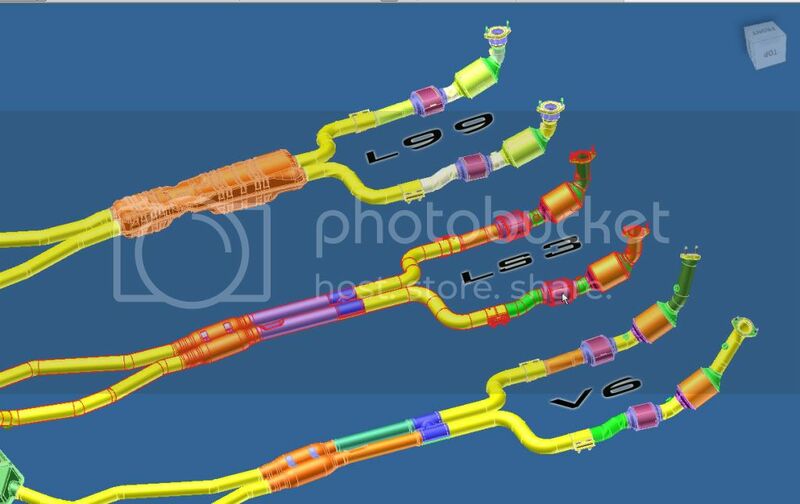 An X-pipe will replace the H-pipe on the LS3 and that hideous resonator on the L99. 2010 2SS A6 - sold. I'm on the same train as the OP. I am getting the SLP Loudmouth II and an x-pipe to replace that god awful resonator hiding the H-pipe. Drives: 2SS w/ ZZ427 Package!! I would suggest the LM II and the X-pipe, that will basically create an axle-back kit, and will definetly help the sound....a LM kit would be even more aggressive, but not as deep of a sound. Let me know if you have any questions I would be happy to help, and I can get you some good prices.